Hill House Antiques and Decorative Arts have this rather splendid Kate Bunce oil in its original tabernacle frame for sale at present. It shows a courting couple (in possibly 18th century clothes, hard to tell in the image) strolling in a park with a peacock in the foreground. I think the frame is the star of this understated but beautiful picture, with the most gorgeous golden display of leaves and berries across the top of the arches. Kate Bunce is probably best known for Melody (Musica) and a number of her pictures are in Birmingham Art Gallery and Museum. She was the daughter of John Thackeray Bunce, newspaper proprietor and chairman of the City Art Gallery in Birmingham. 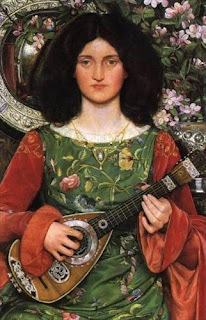 She was a prize winning student at the Birmingham School of Art in the 1880’s and was later greatly influenced by the work of Dante Gabriel Rossetti and Edward Burne-Jones (also from Birmingham). Associate of the Birmingham Society of Artists from 1888 and a founder-member in 1901 of the Birmingham based Society of Painters in Tempera. Her association with the Birmingham art scene has meant her pictures are considered more decorative rather than being given the weight they possibly deserve. I can dream, but really I'd never have the money. 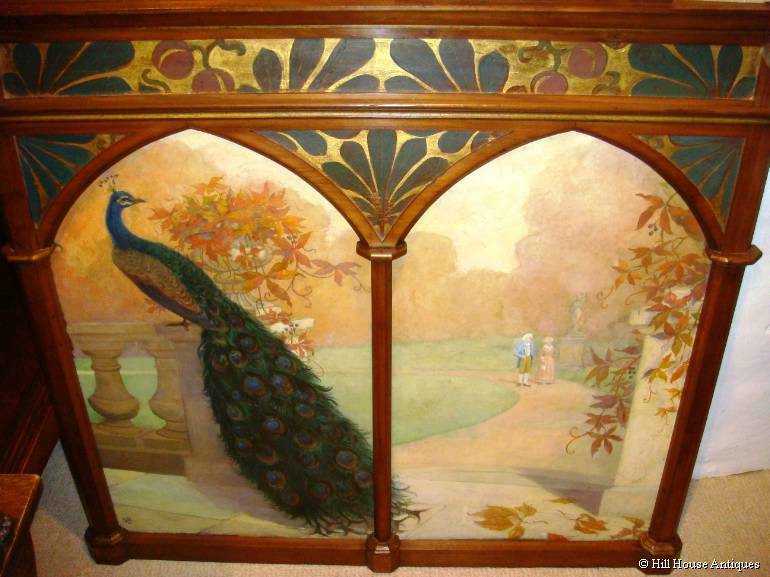 That is a beautiful painting in a beautiful frame, and there's probably some Victorian Gothic-Revival property somewhere that would be the perfect home for it, but sadly that place is not mine. Maybe if we all had a whip round? Hmmm, well when I rule the world and we all live in a Pre-Raphaelite commune, we'll have it hanging in the front room, I promise. Need we wait till you rule the world (though of course that happy day cannot be long in coming)? I have long cherished a fantasy of a retirement home for distressed art historians. A few choice pictures, a decent library, a common room with an open fire and well-stuffed armchairs, cake, of course. Gin. I don't ask for much. We could bicker quietly about abstruse points as we subside gracefully into baffled but thoroughly cultivated senescence. That sounds fabulous. Let's do that. I'll bring cake and gin.